Past masters: Max Shulman and “The Many Loves Of Dobie Gillis” | Name-Brand Ketchup. ← This commercial just flat-out rocked. There are several books that I revisit and re-read from time to time, to get something new out of them. “Catch-22”, “One Hundred Years Of Solitude”, “Cat’s Cradle”, “Cannery Row”, “The Innocents Abroad”, the “Sandman” series are all on the list. But there’s one I discovered in junior high that shaped my early moral values and still makes me laugh like a fiend some 40 years later. “The Many Loves Of Dobie Gillis,” by Minnesota’s one and only Max Shulman. Shulman was the show’s main writer, and (decades ahead of the trend) tweaked and “rebooted” the story line. He added Maynard G. Krebs, Zelda Gilroy, Milton Armitage, Professor Pomfritt, and Chatsworth Osborne III for the small screen. The show was very entertaining and wildly popular, but doesn’t hold a candle to the stories. 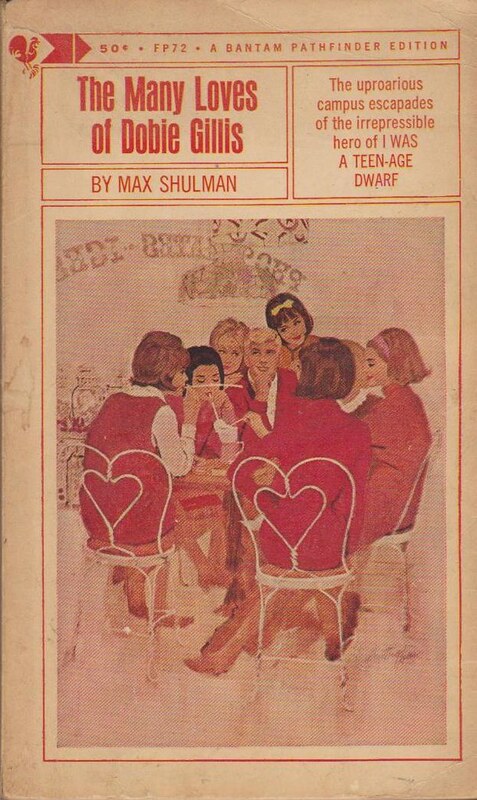 Shulman started writing as a student at the University of Minnesota, for the campus humor magazine “Ski-U-Mah.” He wrote short stories, plays, and books until he created Dobie in the mid-40s. Dobie starred in several short stories for The Saturday Evening Post, and this book compiles them. He’s a student at the U of M throughout the stories, but that’s one of a very few common threads. In each story he’s from a different Minnesota town, pursues a different major, has a different girlfriend, and his father has a different profession. In some of the stories Dobie is smooth and conniving, in others he’s naïve and gullible, and in still others he’s earnest and winsome. The other common thread, of course, is that Dobie is constantly falling in love. Hence the title. Each story is a comedy gem. In “The Unlucky Winner” Dobie’s latest love connives him into plaigerizing a short story for a writing class, but then the impressed professor submits it to a statewide contest. Judged by – who else – but the 90-some year-old author of the original story. In “She Shall Have Music” Dobie sets off to New York City to hire an orchestra for a badly needed fundraiser for Ski-U-Mah, but jeopardizes all in a tryst with his lost love. In “The Sugar Bowl” Dobie’s high-class girlfriend insists on top-shelf treatment, and he strings along a plainer but ardent young girl to gain access to a stash of emergency cash. In “Everybody Loves My Baby” Dobie falls for a beautiful girl who can’t say no to anyone, so can only go out with seven or eight fellows at a time. In “Love of Two Chemists” Dobie and his sweetheart become chemistry majors, but indulge their passions outside of class and must get themselves into the lab over the weekend to complete a final test. In “The Mock Governor” the uncle of Dobie’s girlfriend is distrustful of him, but gets connived into a make-believe gubernatorial election with disastrous results. In “Boy Bites Man” Dobie and his girlfriend are journalism interns at the Minneapolis Journal, and inadvertently stumble across a huge public swindle. In “The King’s English” Dobie publicly locks horns with a pedantic English professor while his girlfriend attempts to corner the market on used sales of the professor’s textbook. “You Think You Got Trouble?” bears the closest resemblance to the TV show. Dobie’s parents run a grocery, and his father can’t understand why his son would ever want to study Egyptology. En route to finals wackiness ensues, and Mr. Gillis shows a rare moment of empathy toward the mother of a young woman who doesn’t follow her guidance any better than Dobie follows his. “The Face is Familiar But—” could have been lifted directly out of this book and aired as an episode of Seinfeld. (Remember “Mulva”?) Dobie hits it off with a girl, but through no fault of his own doesn’t quite catch her name. The hoops and gymnastics he goes through to try and discover her name will resonate with any hapless guy who’s ever struggled to make a smooth impression on a first date. The genius of Shulman resides in the cleverness of the situations and the matchless beauty of the writing. Shulman’s small-town background and young adult experience at the U of M breathe life into Dobie and his many loves. And besides being comedy gems these are also coming-of-age stories for young and idealistic men, figuring out their places in the world and how to deal with love and responsibility. Find it, read it. You’ll thoroughly enjoy it. Postscript: The movie “Ferris Bueller’s Day Off” owes a great debt of gratitude to Dobie. More the TV series than the books, as Dobie and Ferris would both “break the fourth wall” and provide exposition to the viewer. And when Bill Hanna and Joe Barbera first conceived of the cartoon series that would eventually become “Scooby-Doo, Where Are You?” they initially planned to update “Dobie Gillis” in a mystery-solving genre. Fred was loosely patterned after Dobie, Daphne after Thalia Menninger, Velma after Zelda, and Shaggy of course after Maynard. Plans obviously changed a bit over time. Many years ago I read `The Unlucky Winner`in a collection of short stories by writers from the USA. Loved it, and it has stayed with me ever since. I didn`t recall who it was by, and never knew it was part of a larger work. Thanks for this entry, I will now hunt down The Many Loves of Dobie Gillis!